Recently we had a chance to talk with Rebekah about her love of yoga and her passion for teaching beginners. Unfortunately, the feeling Rebekah so vividly remembers only lasted for about 30 min. After the feeling went away, Rebekah knew that she would have to keep going back so that she could experience that feeling again and again. Rebekah started going to class once a week and still remembers her first teacher, Peggy, and credits her for exposing her to all the benefits that yoga can provide. Moving to a new city helped Rebekah make the transition from a gym to a studio. Rebekah remembers the studio environment being intimidating in the beginning. She remembers seeing a lot of props and having no idea what they were for or any idea how to use them. After attending a few classes at the new studio, Rebekah began to love the studio environment. She found the studio to be more holistic, consistent, and educational. Teachers leveraged a variety of approaches when teaching; verbal cues, physical adjustments, and demonstration techniques. Over time, the poses started to have meaning, and she started to build a stronger practice. Rebekah too has had to take a yoga hiatus. She commented that moving from Texas to California impacted her practice. After every big move, it would take time to settle in and build up the courage to attend a new studio. When she wasn’t practicing regularly, Rebekah remembered missing the feeling she had when she was practicing yoga. She missed the sense of wellness, strength, and flexibility yoga provided. Even though she was able to stay active during her time off the mat, Rebekah still felt like something was missing and eventually would find herself back on the mat. After moving to California, Rebekah’s yoga practice became more consistent. You will often find Rebekah at Refresh teaching, practicing, and spending time with the Refresh community! Rebekah loves beginners. She vividly remembers what it was like to be a beginner and she is passionate about making yoga more welcoming. During the Beginner Series, Rebekah has time to give students more individualized attention; she provides students the tools they need to start their practice in a positive way. Rebekah also loves the camaraderie that develops among beginners. Beginner Series students share the experience of starting something new. Rebekah fosters a safe space so that beginners have the opportunity to be vulnerable and open, perfect conditions for relationship building! Why a 4 Week Beginner Series? In order for poses to make sense physically and emotionally, practice and repetition is required. Rebekah believes that you need at least four weeks and additional practice time to assimilate something new and learn. (And let’s face it, we are busy! Four weeks is a manageable commitment but give you enough time to reap the benefits of the series!) The four week Beginner Series provides new yogis with a consistent time to learn and practice. Also, Beginner Series students who are new to Refresh receive unlimited classes during the series (so students have ample opportunities to get on their mat!). Who doesn’t! Come check out one of her classes! 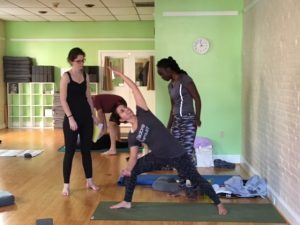 Refresh Yoga Center serves the community of Old Town in Alexandria, Virginia; Ft. Belvoir, National Harbor, Arlington, Del Ray, Annandale, Belle Haven and Oxon Hill. Offerings include beginner yoga, stretch classes, core strength, prenatal yoga, and yoga for seniors. Child minding is offered as an answer to child care on Fridays. Find us on the 2nd floor at 110 King Street near the waterfront. We are proud members of the Old Town Boutique District.